Eager for a piece of WP7? Here are the top phones you should consider, broken down by US carrier. You're welcome. Like many of HTC's WP7 phones announced today, the 3.7-inch Mozart has a 8MP camera and Xenon flash, and also has Dolby Mobile and SRS Wow HD for "virtual surround sound." Otherwise, there's a 1GHz Snapdragon processor, 512MB RAM and 576MB of ROM, and 8GB of internal storage. The phone itself measures 119 x 60.2 x 11.9mm, and weighs 130 grams. Bluetooth, Wi-Fi, a G-sensor, ambient light sensor and GPS are also included, as with HTC's other phones. This is a big beast at 4.3-inches, but inside there's 16GB of storage and a 5MP camera. Check out what Matt has to say about the HD7 here. 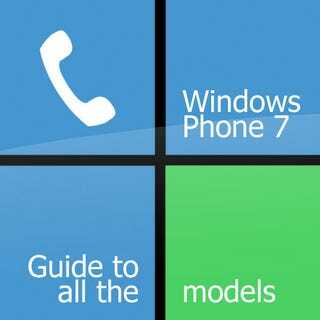 Want something different from your WP7 smartphone? How about a vertical slider, with a 4.1-inch screen? Check out Brian's first impressions here. At 3.8-inches with a 480 x 800 resolution, it's a little larger than the Mozart, and internal storage is just 8GB. Considering this is a media-tuned device, that's a little surprising. The processor is powered up at 1GHz, and there's 512MB of ROM AND 576MB of RAM. Weighing 165grams, it measures 119.5 x 61.5 x 12.97mm, and has the usual assortment of specs such as Bluetooth 2.1, Wi-Fi, a g-sensor, ambient light sensor, and a 5MP camera with LED flash, capable of 720p video recording. Inside, a 1230mAh battery lurks. With a 4-inch Super AMOLED screen, the Focus is the thinnest of all WP7 phones. As to whether it still makes for a good phone, wait and see. Europe, it'll be known as the Omnia 7 to you. A rounded 5MP Snapper, the Quantum has a slide-out QWERTY keyboard. Internally, it's roughly the same phone ticking away as the various other WP7 handsets HTC is launching, with a 1GHz Snapdragon processor, 512MB of RAM, 576MB of ROM and 16GB of internal storage. That extra memory will be hugely appreciated, I'm sure. It's a little smaller in size than some of the other handsets, despite its slide-out keyboard. It measures 117.5 x 59 x 15.5mm, and weighs 183.5 grams, and is crammed full with the usual specs, along with a 5MP camera with LED flash (capable of shooting 720p video), and a more powerful battery at 1500mAh. The Pro won't be released until the first half of 2011. Either the Optimus 7 will be available on most networks worldwide, or the carrier just hasn't been announced yet. It's a 3.8-inch candybar with 16GB of internal storage, and has a 5MP camera. In the meantime, the Trophy should be one of the cheapest WP7 phones on the market. Internally, it has 8GB of storage with 576MB of ROM and 512MB of RAM, and has a 3.8-inch WVGA screen, and measures 118.5 x 61.5 x 11.96mm, weighing 140 grams. Instead of compromising on the camera or battery in favor of keeping costs down, it's a 5MP effort with 720p video recording (Microsoft's lowest-allowed spec for WP7 phones), and the battery is a 1300mAh.